Benue State Governor, Samuel Ortom congratulates former Vice-President, Atiku Abubakar, for emerging the Peoples Democratic Party, PDP Presidential candidate for the 2019 elections. 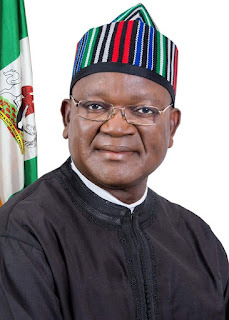 Governor Ortom says the credible conduct of the presidential primary election was confirmation that the PDP is a party that truly practises transparency and internal democracy which give the people the freedom to choose those to lead them. He describes Alhaji Atiku Abubakar as an experienced administrator, tested politician and Nigerian who understands the problems facing the country and has the capacity to fix the challenges. Governor Ortom expresses confidence in the ability of the PDP Presidential candidate, who is a title holder in Benue State - (Zege Mule u Tiv), to provide credible leadership for the country, if given the mandate. The Governor is optimistic that Nigerians will vote for the rebranded and refocused PDP in next year's elections to address the plethora of challenges confronting the country, and turn around the economy and security situation which the All Progressives Congress, APC administration has apparently failed to handle.